B. Thomas (Arlington, Texas, United States) on 29 September 2011 in Landscape & Rural. 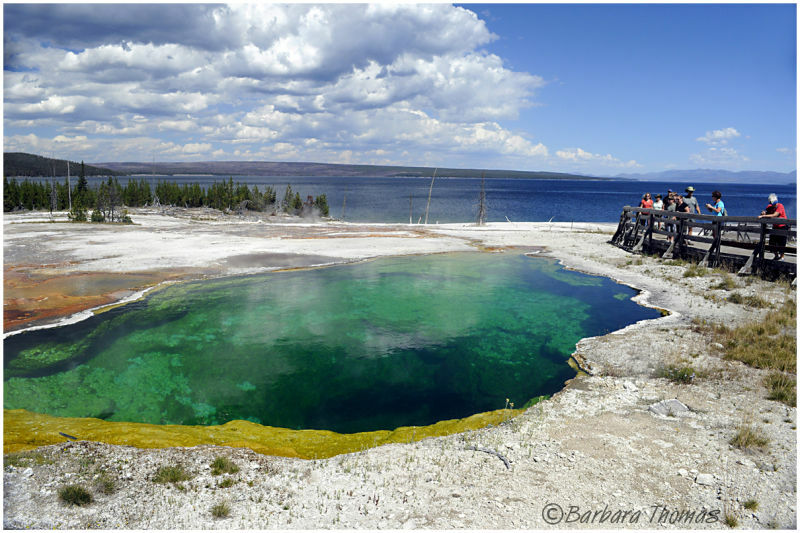 A short loop trail leads past steaming hot springs and pools beside Yellowstone Lake. This section of Yellowstone Lake, in the background, is the deepest (390 feet) and is actually a caldera that filled with water after erupting 150,000 years ago.There is still heat just below the surface, and the West Thumb Geyser Basin is right along the shore. You have some fantastic places to visit there Barbara, some great opportunities for landscape photography. Love the greens in this pool. I'm with Curly, these are great scenes even from a Texan. LOL! Lovely colors and details in the hot springs...beautiful! This is amazing!! !Everything from the color and clarity of the water, to the gorgeous lake beyond. I am appreciating the scale of this, too! @Tracy: Thanks, Tracy. I wanted the people in to show the grand scale. Oh Wow, we missed this too...we were on a mission to get over to the Falls and blew by here...I love this image, Barbara!! Thank you for this - this is great and a great bit of information too....Next time...! Strange how the landscape colors are so different here . .
A beautiful place and a very nice shot of it ! There is just no end to the amazing landscapes of Yellowstone. The lake makes a nice backdrop, Barbara. Gorgeous colors. I remember this from my one and only visit in the late 80's. very similar to the new Zealand thermal areas that i visited! lovely composition here with good calrity and wonderful colours!